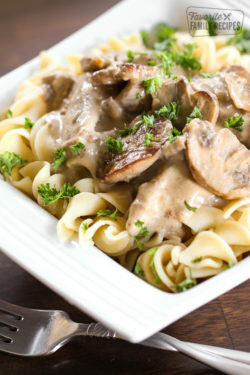 This Beef Stroganoff recipe is an old family favorite, with tender, juicy meat smothered in a rich, creamy mushroom sauce. It'll become a classic at your dinner table too! Pound meat to tenderize, then cut into VERY thin strips. Place flour and salt in plastic baggie. Add meat and shake to coat. Melt butter in large skillet or frying pan. Add onion and mushrooms and sauté until onions are transparent. Add meat and all of the flour that is left in the bag. Cook meat until brown. Add the soup and milk, stir and cover. Simmer and stir occasionally, for about 2 hours or until meat is tender. The sauce will thicken while cooking. If it becomes too thick you can add more milk or beef broth. Add sour cream and Worcestershire sauce just before serving.